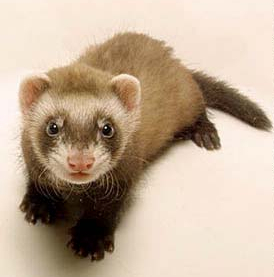 Dweezil Da Weasel was a 4-year-old neutered male ferret. His owner had recently arrived in Blacksburg from Orlando, Florida and noticed that Dweezil "...wasn't himself any more," in that instead of constantly moving about and exploring, he'd become very lethargic and intolerant of exercise. Thoracic radiographs revealed cardiac enlargement and edema of the lungs. A blood sample was tested for heartworm and turned up negative; so Dweezil was put on Lasix (furosemide) and digitalis, but responded poorly. 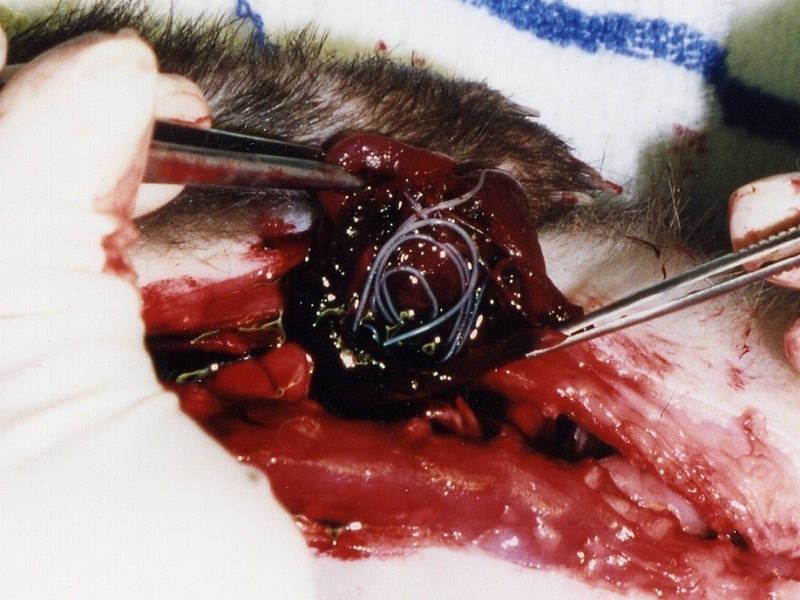 He was euthanized two weeks later and a necropsy performed, which confirmed the presence of Dirofilaria immitis (above right, in a gross specimen). The final post-mortem diagnosis was heartworm disease. 1. If this is "heartworm" disease, why is it a respiratory system case at all? What's the connection? 2. How did Dweezil's clinical presentation signal issues with the respiratory system as well as the cardiovascular system? 3. Could this have been prevented?